We're now in Australia for five weeks spending the first ten days in Sydney. I am dead happy to be back in a meat and potatoes country - a land of beer and BBQ's! I've heard plenty about Sydney beforehand so I had some pretty set expectations. Sure enough, it was everything that I had heard. It's a city that I knew I would like. Physically, it really is quite similiar to Vancouver but with a warmer climate. Vancouver has a more dramatic setting with the backdrop of mountains while Sydney is quite flat. Sydney harbour has a much longer shoreline with many more waterfront houses and an excellent ferry system. There's more "life" to the harbour. The downtown core of Sydney is smaller with a less impressive skyline than Vancouver. Sydney sprawls out more compared to Vancouver which has a much more restricted space to grow. The architecture of the buildings and houses are similiar. Sydney seems to have a greater stock of cheap old houses which are now getting ripped down and replaced with new ones. Unfortunately, both cities have nasty traffic problems and very expensive housing. It takes a while to drive anywhere in Sydney. I get the impression that the infrastructure isn't as well maintained in Sydney. It's clean but some of the roads and sidewalks are rundown. I assume that's just tax dollars being spread thinly over a wider area than Vancouver has to deal with. But like Vancouver, I can't afford the houses I would most like to live in. The lifestyle certainly feels similiar in the two cities and the better climate gives Sydney the edge. Sydney has much better beaches. We spent a great afternoon hanging around on Manley beach. Much better than Kitsalano. We spent New Years Eve down at MacMahon Point to watch the fireworks. We had a fabulous view and I can honestly say it was the best fireworks display I've ever scene. 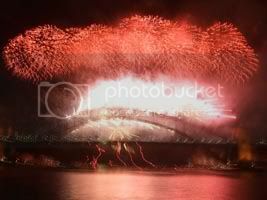 The fireworks exploded in a wide panorama from two barges, the harbour bridge and eight locations on office block towers in the city. Quite a spectacle. Taronga Zoo didn't live up to the hype and entrance fee. It has a great location with views towards the city but the zoo itself is nothing special compared to others I've seen. The highlight for us was seeing the Australian animals and the platypus in particular. Alright, the meerkats are very cute too. The Australian Museum was very good and we're sorry that we ran out of time just as we discovered the hands-on resource center. It had a good installation on Aboriginal history and culture. 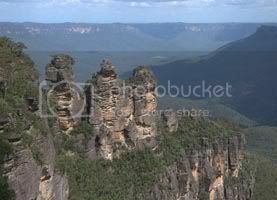 We spent a day up in the Blue Mountains and did a short walk from Echo Point in Katoomba. Very pleasant area but not what I would call mountainous. It's worth a lot more exploration. Fantastic scenery. There's a huge amount of other things to do in Sydney and the local region but we simply did not have enough time. You would need a few months! I have no doubt I would enjoy living here for a year or two. Australia has a much stronger British heritage than Canada but having lived in both countries, Australia feels very comfortable.